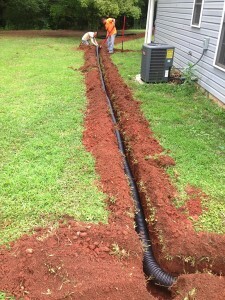 Cochran designs and installs custom irrigation system Liberty properties need. Having an automatic irrigation system installed is an important element of all landscaping needs. Irrigation systems are important for both residential and commercial properties. For Liberty residents, irrigation systems are a must in order to keep your lawn healthy and beautiful. By choosing Cochran, you are not only working with the best company available to Liberty residents, but you are also working with trained professionals. We will properly install your system and educate you on operation and maintenance repairs. Irrigation System Design: We work to create the best design unique to you and your lifestyle. Installing a sprinkler system is a larger investment. We work to make it the best, long-term investment in landscaping. By using the correct materials, such as sizes of pipes and valves, using our expert knowledge pertaining to zoning and piping routes. Irrigation System Repair: At Cochran, we work to find the root of any sprinkler system issue Liberty residents may have. It is essential to recognize these small problems to ensure your system operates to its fullest potential. Common problems we tend to see involve clogged sprinklers, leaking sprinklers, and over-spray. Let Cochran fix your landscaping problems and make your life easier! Irrigation System Maintenance: Sprinkler system design and maintenance has become very popular. It makes a huge difference for your landscaping. At Cochran, we have only the best professionals for your sprinkler installation, maintenance, and repair needs. We will work with you to maintaing the longevity of your system. We’ll make sure your outdoor space stays healthy and beautiful. For a variety of irrigation system and sprinkler system information, visit the Home Depot’s irrigation website.